Some parents might find the thought of baby entertaining daunting when there is more than just their own child to amuse. But a 1st birthday party is easy to host, especially with these simple and inexpensive ideas. Parties for 1 year olds are perfect photo opportunities, so make sure all cameras are charged and at the ready. The birthday child probably won’t remember the event for very long, but years into the future he will appreciate looking back through the family memoirs and recognise the effort that was made just for him. It is a good idea to enlist a keen photographer friend or relative to take pics on the day. Ask them to get a snap of each child at the party, as those are nice to include with thank you cards later. 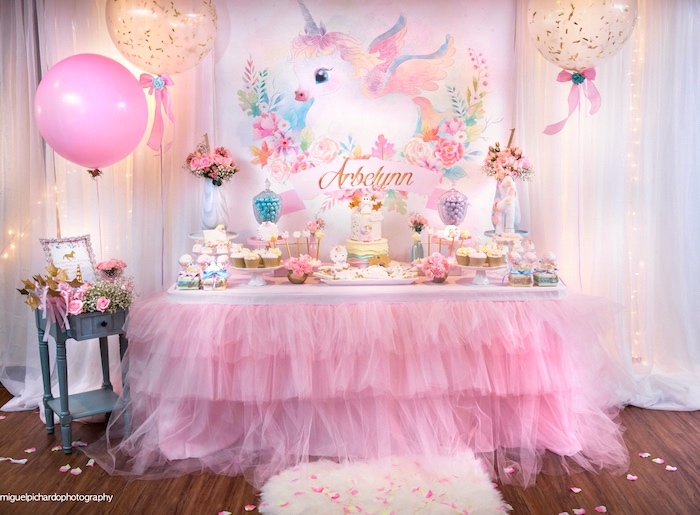 Parties for tiny tots should be short and sweet. Specify a timeframe, say 3–5 pm. Two hours is ample. Consider children’s nap routines when choosing the time. Contain the party in just a couple of rooms to make mixing and mingling easier and so everyone can keep an eye on their kiddies. It will also make cleaning up easier. Helium balloon kits are a great investment. The Warehouse in New Zealand sells a good one, which comes with about 30 balloons, for about $60NZ. Floating helium balloons around the ceiling creates an instant party atmosphere. It’s also a good way to signpost the rooms in which guests should gather. Tie each balloon with a long strand of curling ribbon so the “littlies” down at floor level can have some fun pulling and tugging on them. Don’t inflate the balloons until near the start of the party so there will still be a bit of float time left in them if guests want to take a few home. Normal balloons, like those supplied in kits, float for anywhere between eight and 12 hours. Helium quality balloons float longer but cost more (about $2NZ each). There are plenty of ways to amuse newly or nearly mobile tots. Boxes are always a hit. At around 12 months, children like to climb in and out of and stack boxes. Children will enjoy them just as they come but keen hosts might like to paint or decorate them to enhance a party theme. Invest in a fabric tunnel. Although a large item, they are relatively cheap. The New Zealand hardware chain, Bunnings, sells a bright green caterpillar tunnel for around $15NZ. Baby entertaining requires music! Play a collection of children’s songs as background music but turn it up occasionally so everyone can have a boogie. Babies love to dance and will certainly find it amusing to watch adults do the same! Don’t forget, public libraries are a cheap place to source CDs. Bubbles are a good way for adults to join in the fun and interact with the “littlies” at 1st birthday parties. Look for bulk packs of small bottles, which can be given to each guest as they arrive. At the same time, give each baby a party hat to wear. Lightweight cone style hats with elastic under the chin are usually quite well tolerated – and look very cute in photo’s! Scatter a few highly appealing, age-appropriate toys in the party room. One year olds enjoy nesting cups, blocks, things that make noises when buttons are pushed and other cause and effect toys. They also like colourful beach balls and posting items into receptacles. Toy libraries are a great source of larger toys and hire them out cheaply. Plastic ride-ons are always a hit with 1 year olds. There is no need to put on a huge spread – babies eat very little. Adult guests won’t want much either, but with all this baby entertaining they might appreciate a couple of drinks. Snacks for babies must be age appropriate, small and dry. Avoid serving anything gooey, creamy or saucy as these will probably end up all over your furnishings instead of in children’s tummies. When it comes to 1st birthday party ideas for cakes, think healthy and think photos. Parents will heave a sigh of relief when a nutritious carrot cake appears instead of a sugary stack of meringues. Cakes in the shape of numbers are always impressive in photos. Gifts can be opened later but make a special point of piling them where everyone can enjoy the brightly packaged parcels. Allow the birthday child to rip up the wrapping paper when he opens them later – it’s one of the first rules of Baby Entertaining. Keep a note of who sent what and specifically mention each person’s gift in their thank you card.